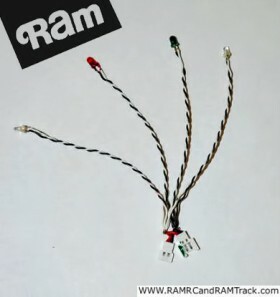 Ram Radio Controlled Models Incorporated, long time manufacturers of innovative electronic devices, has added four new products to their already extensive line of RC lighting systems. The RAM Quad Lites are designed to enhance the visibility and inflight orientation of several popular micro sized quad rotor aircraft, including the Traxas QR-1, Heli-Max SQ1 and Blade MQX. Each set of lights includes two white, head lights and both red and green flashing tail LEDs. The lights are installed inline with the battery connection and each set weighs two grams. A third set can be used on aircraft to 24″ inches in span, weighs 3 grams and can be powered by a one, two or three cell lithium battery.